Tip of the cap to the golfer J.P. Hayes, who recently disqualified himself from the PGA Tour due to an accident which happened while playing in a recent tournament. Hayes pulled out a ball from his golf bag which he couldn't use during the tournament and while he didn't get caught using it, Hayes stood up and excused himself after making the wrong play. He will not get a PGA tour card and unfortunately has to wait for sponsor exemption to play in 2009 PGA golf events. Over the last several days he's been commended for his ownership and ability to "do the right thing." 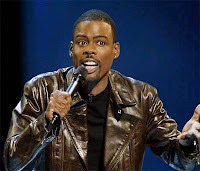 HOWEVER, in the words of Chris Rock "I'm not giving you credit for sh*t you supposed to do." Maybe the rest of golfers on tour wouldn't have turned themselves in unless they were caught, maybe five out of ten people wouldn't return a lost wallet without taking the cash out first, and maybe you don't give extra change back when the cashier gives you more than they should, but your supposed to. I ask what in the world have we come to when we pat a guy on the back for doing things he should do, you should visit your grandmother in the hospital, you should not take an extra ten minutes on your lunch break, and of course, you should turn yourself in when you realize you've broken the rules, even if it is inadvertent. KEEP IT REAL FOLKS! Biggest week in college and pro football yet. Texas Tech and Oklahoma play in Norman this weekend and you don't get much bigger than that. Graham Harrell, Michael Crabtree, and Sam Bradford all look to add to their heisman resumes. If Tech wins they remain in the drivers seat for a shot at the National Title. If the Sooners win, the Big 12 South becomes utter chaos, riveting. Boston College at Winston-Salem (Wake Forest) Don't laugh, the wild card in all this, one team from the ACC is guaranteed to play in a BCS bowl game. Following their win at Florida State the Eagles head to Wake Forest, a win at Wake puts them one game from a second straight appearance in the ACC Championship Game. You know I'll be watching. New England on South Beach (Miami Dolphins) after stunning the Patriots earlier this season the Dolphins have improved to 6-4 and with a win this week, they would overtake them in the AFC East. The Patriots could be in first place by Sunday night, a win and a Jets loss puts them right back atop the division. Favre and the Jets head to Tennessee I'm still not buying it Brett, I don't care that you eeked out a win in overtime against the Patriots after surrendering an 18 point lead earlier in the game. Tennessee is big and physical, by the way they haven't lost yet either. The Titans win this game, convincingly. Sidenote: Woohoo, Adam Jones has been reinstated. Sense any sarcasm? I like Pacman as a player but as a person ehhhh NOT SO MUCH. He still has to sit out another two games and won't return till December, so as far as I'm concerned . . . . . . . MOVING ALONG. KEEP IT REAL! More football on the slate. For those of you who've been living under a rock for the past four days, the Eagles and Bengals finished with a 13-13 tie on Sunday. This sparked Donovan McNabb, Philly quarterback, to inform us he had no idea you could even end the game in a tie. Really Donovan? Several things need to be addressed here. One, Andy Reid does a poor job of preparing this team to win football games. If you need two overtimes to put away a team like Cincinnati led by Ryan Fitzpatrick, you deserve to get a notch in the loss column. I guarantee the Broncos, Patriots, Colts, Giants, and Titans all are well aware that a game ends in a tie if you don't win it in the first overtime. Two, all this garbage about 50% of players in the league not knowing about this is straight BS. I heard that former, yes FORMER, Baltimore Ravens head coach, Brian Billick agreed that 50% of players probably didn't know the rule. This coming from a guy who continued to march Kyle Boeller out there at quarterback when he had a hall of fame defense on the other side of the ball. A guy whose team gave the Miami Dolphins, the dreadful Miami Dolphins their only win in their 1-15 season of 2007. So stop it, as my buddy Joe said, if he's saying 50% of players don't know that, I'm taking the over EVERY DAY OF THE WEEK. KEEP IT REAL! Okay, so I'm sometimes a bit of a homer when it comes to things like this next one, but your just going to have to deal with it. I recently read a story that had Tony Romo purchasing a movie ticket for a homeless man sitting outside the theater. Earlier this season we all heard the story how Romo pulled over on the side of the road, after flying back to Dallas on a return flight from Cleveland, and assisting a stranded motorist in changing a tire on their disabled vehicle. After reading the story that put Romo in the movies watching a flick with this homeless man, I'm convinced, Tony Romo is still in awe of being in the NFL. I always wondered what it would be like for me, to be a professional athlete. I'd probably have a fans mentality and seek out autographs, get players cell phone numbers so we could party, and probably buy frivolous things with my money, it's just what I'd do. Romo however, is taking a different route. For the average guy, which was what Romo used to be when he was backing up the likes of Drew Bledsoe, he probably never thought he'd date country music stars and pop icons. Romo probably never imagined being able to attempt a side job as an amateur golfer. Finally, he probably never thought he'd have the type of bank account which he does. 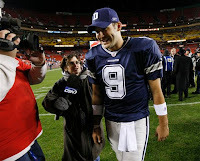 So everyday when we see Romo with Jessica Simpson and ask why? Keep in mind, she wouldn't be into any of us and for Romo who was so used to being the average guy, he probably thought the same thing, until she was. When you see a guy like Romo changing tires and helping the homeless see a new movie, I'm sure on some level Romo is still in shock that he's who he is, and does these things as thanks for who he has become. Ask yourself, have you ever pulled over and changed a tire for someone else? I haven't. KEEP IT REAL! Shhh, don't look now but Trail Blazers rookie center, Greg Oden, is averaging 10 points and 8 boards a game. He isn't even 21 and he's got the one thing you can't teach . . . HEIGHT! Keep it Real! I can't stand Drew Rosenhaus, when I say can't stand I actually mean loathe. 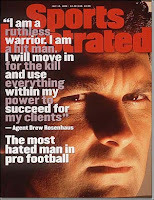 Of every person involved in any way with the NFL, Drew Rosenhaus is the person I dislike the most. I fortunately was able to get most of Thursday morning off from work, ten minutes before I headed to said job I was able to watch a 10-minute interview on ESPN with Mr. Rosenhaus, fun stuff. The purpose of Rosenhaus being interviewed was to give his and his client, Chad Johnson, view of what transpired to result in Johnson being deactivated for last nights game against the Steelers. Rosenhaus blabbed on about how Johnson will play hard the next five games, he's disappointed with his role in the offense, and he also told us that Chad HAD to play with a back up quarterback all season as well. I'd normally rear into Chad about how he annoys the sh*t out of me and I'm sure I wouldn't be the only one. Truth is, Chad needs someone to speak for him, because every time he speaks, nonsense comes out. Unfortunately for the world, Rosenhaus is his mouthpiece, as he was Terrell Owens' and every other football player making major dollars. I won't deny that Drew is great at his job, but does anyone else make you feel more dirty listening to them speak? He makes excuses for his players, commends their horrible behavior as role models and does nothing to have fans embrace those athletes. Rosenhaus is the most uber of agents, and athletes can't get enough of him. I on the other hand, have had enough of him. Please, stay out of the cameras and KEEP IT REAL! GET READY FOR SOME THANKSGIVING FOOTBALL . . . .